Is Jenna really the only one with a motive for killing her ex? Jenna is an odd character, and I had a hard time deciding how I felt about her. There were times when I was highly annoyed by her attitude, and then other times when I felt sorry for her. Jenna has a very easy going attitude, and despite her lack of close friends, she is friendly and pleasant with most of the people she meets. However, she doesn’t seem to be overly concerned with anything that doesn’t directly affect her. I found her to be self-centered, and I don’t like how she treats the few friends that she has. Fortunately, as the story progressed, Jenna made some progress in that department. I truly believe she is well on her way to being a more compassionate person. When Jenna’s ex is killed, she is the prime suspect. Understandably, she wants to clear her name as quickly as possible. However, I don’t think she went about it in quite the right way. She seems to go out of her way to irritate the detective on the case. With all the stunts she pulled, I’m very surprised that she didn’t get in serious trouble. I couldn’t help but think that if she had been more forthcoming with the information she had compiled, she and Detective Johnson would have gotten along much better. Despite this issue, I will admit that Jenna really does have a talent for being a good detective. There were very few leads in the case and she does an excellent job of tracking down every shred of evidence she can find. The conclusion of the mystery caught me off guard. There were very few suspects, but the true culprit was not someone I had ever seriously considered. Once Jenna began to suspect this character, everything wrapped up in a quick, but satisfying way. 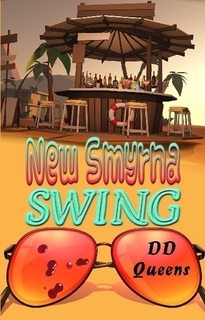 I think New Smyrna Swing is a good book. I enjoyed watching Jenna solve the case in her unique way. I recommend it to anyone looking for a quick and fun mystery.